Many of the children of the community had witnessed and suffered violence, hunger and other senses of insecurity. The supportive environment in Israel allowed them to develop and express their unique qualities, talents and dreams. Children who are aspiring artists, scientists, musicians and writers were deported without the resources to further develop their already impressive skills. Our program is intended to allow the children to continue to study and fulfill their dreams within their new lives. South Sudan is the youngest country in the world, emerging from a decades' long civil war. The country suffers from lack of basic services and infrastructures such as roads, electricity, sewage, water, communications, health, welfare and education systems. Unemployment rates are sky rocketing, diseases such as malaria and typhoid are common and ill-treated, and the population suffers from hunger and lack of access to safe drinking water and basic health services. The education system in South Sudan is ranked the lowest in the world. Ethnic clashes within South Sudan, which erupted in December 2013, made the situation even worse, killing over 400,000 people and leaving over two million people displaced. South Sudan now faces a grave humanitarian crisis and famine anticipated to be the worse that Africa has known the the past two decades. Refusing to accept this destiny, a group of South Sudanese parents and their Israeli friends decided to start this project aiming to send the children to a boarding school in Uganda, while the parents remain in Juba and try to set a better footing in their new land. This way the children could benefit from a safe educational environment, while we continue to work toward a long term sustainable educational solution in Juba. In a visit to Kampala, Trinity Primary School has been chosen to host this exciting and hopeful project. On February 2013 the first group of excited children boarded the bus in Juba en route to Kampala to start their new school year. The project grew immensely thanks to hundreds of Israeli donors, and it now accommodates approximately 200 children studying at boarding schools in Kampala. We hope to be able to raise more funds in order to send more children to these wonderful schools during the forthcoming school year. Come True is a unique project because it sees the large educational picture, and yet relates to each child as an individual. Since many of the families are still in an unstable situation, finding it hard to provide for their children, we offer these children a year-round solution, covering all their needs, both during the school year and on school breaks. We not only pay the school fees for our children, but also take care of their health, buy the basic school supplies, clothing, footwear and equipment throughout the year, and care for them during the four months each year when school is out. 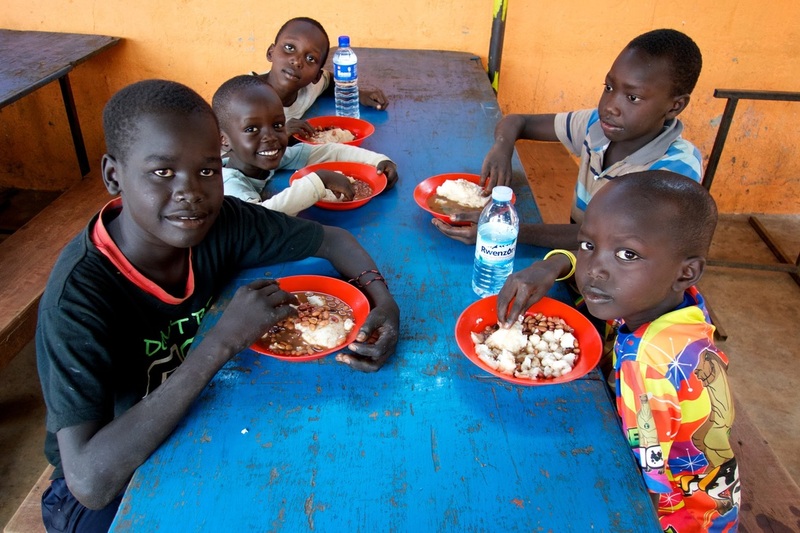 During school breaks we rent, in Kampala, a compound large enough to accommodate all our of children, we see that they are provided with adequate, nutritious food and that their health needs are cared for, and we send volunteers from Israel to tend to them together with parents representatives. We have set up a joint education team, comprised of educators from Israel, Uganda and South Sudan, sharing our views and experiences. Through this communication we have come to learn that the common ground we share is greater than our differences. Based on this solid foundation we have developed an educational model, which we intend to set up as the basis for a school we intend to build in South Sudan in the future. To learn more about Come True click here. Please join us to help realize these children's dreams! The annual cost of tuition and boarding for one child at the Trinity school is $1,350. With a monthly donation of $110 you can sponsor a child. A donation of $50 will help us fund a one-time entry visa to Uganda for one child or school uniform and shoes for one child. A donation of $100 will help us purchase textbooks, uniform and personal equipment for a child for one school year. A $200 donation will help us purchase clothing, toiletry, school equipment and basic needs for one child during one school year. A $350 donation will cover a child's tuition for one trimester. A $500 donation will help us care for one child during the school breaks for one year. Any donation, one time or monthly recurring, is welcome and will help us to cover the school fees and other expenses necessary for the children’s education and welfare! We invite you to join this quest to change the world, and help these children BECOME the future leaders, artists and scientist of South Sudan.